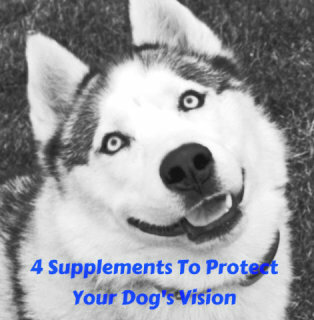 One of these 4 supplements, each in a different formulation, can help improve the overall health of your dogs, to lower the chances of potential vision problems, and to improve any eye problems they may be suffering from now. 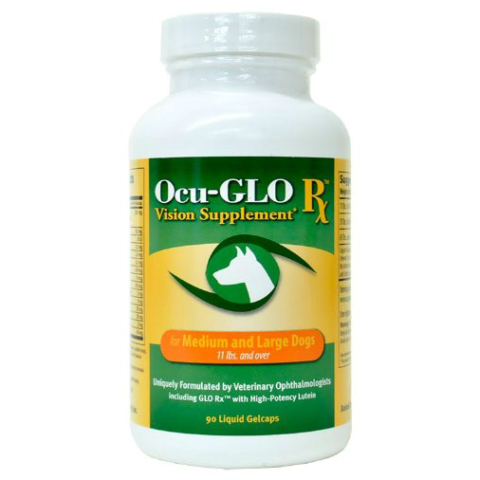 Ocu-Glo Dog Vision Supplements, developed by board-certified veterinary ophthalmologists, are especially designed to help support canine eye health. It contains 12 anti-oxidants that have been proven to be helpful in preserving and maintaining vision in dogs and can be helpful for protecting eye cells from oxidative damage, which causes Progressive Retinal Atrophy (PRA), old age retinal degeneration, diabetes, cataracts, glaucoma, and dry eyes. The primary ingredients are lutein, grapeseed extracts, and omega-3 fatty acids. It comes in two sizes, one for medium to larger dogs and one for smaller dogs. These are BIG pills, and a facilitator for swallowing is a must. We recommend Greenies Pill Pocket Soft Dog Treats. 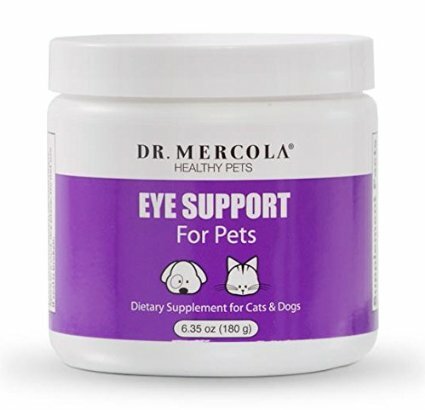 If you prefer a supplement in powder form, Dr. Mercola's Eye Support for Pets supplements contain some of the top eye health-supporting antioxidants available including lutein, astaxanthin, zeaxanthin, and vitamins C and E from healthy non-synthetic sources. It is a liver-flavored powder that you can add to food. Dr. Mercola's eye formula emphasizes astaxanthin that some studies have found to be successful at fighting free radicals that help to protect the body from oxidative damage. "Astaxanthin is found in microalgae, yeast, salmon, trout, krill, shrimp, crayfish, crustaceans, and the feathers of some birds. It provides the red color of salmon meat and the red color of cooked shellfish." (Wikipedia) Since dogs can't produce their own astaxanthin, it has to be obtained from their diet. These supplements have a high level of astaxathin to help fight damage. 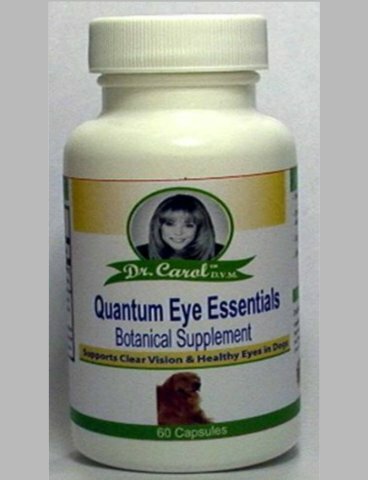 Dr. Carol's Quantum Dog Eye Essentials is designed to offer support for healthy eyes and clear vision. It promotes a healthy cornea, lens, and retina. It includes essential vitamins to supply healthy eye growth and rejuvenation, and uses quality antioxidants to improve your pup's natural bodily detoxification process. Dr. Carol's claims to be “the most complete eye protection formula ever conceived…” In addition to antioxidants to protect against free radicals, it includes therapeutically effective amounts of zeaxanthin (6,000 mcg), the most powerful carotenoid for eye protection, lutein (3,500 mcg), two powerful carotenoids that promotes optimal eye health. It also contains known eye protectants like bilberry, blueberry, eyebright, gingko biloba, alpha lipoic acid, grape seed extract, and tons of other healthy anti-aging ingredients. ReVision is a great name for this product because the ingredients are all focused on your pup getting the optimum ingredients to regenerate her ocular tissues, thereby slowing down the natural process of atrophy in the canine eye. PedMD ReVision Eye and Vision Support Formula claims to aid in the prevention of vision loss and the cloudy vision caused by cataracts. Some dogs love the taste of these chewy vitamins and other dogs won't go near them, but I'm of the opinion that, like our kids, if it's good for them, you can find a way to make it more palatable. 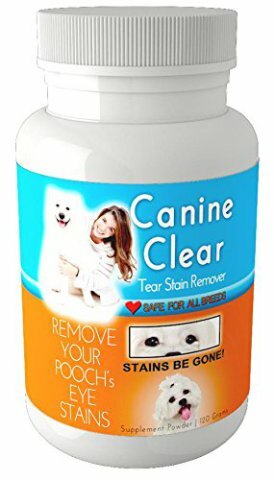 I've added Eden Pond Clear Supplements to this list of eye supplements for dogs since so many of you asked about what would help with tear stains. Eden Pond Canine Clear Supplements are designed to effectively eliminate tear stains around the eyes and mouth by introducing certain vitamins and minerals to your dogs diet. This supplement works to get rid of tear stains before they begin. Simply sprinkle a little bit on your dogs food every day. 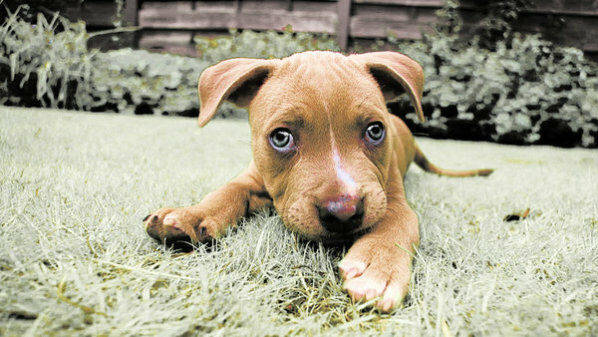 Effects won't begin immediately, but after a week or two, you should begin to see your pup's tear stains clear up as your dog's new coat grows in. (In the meantime, you can clean your dog's tear stains with Pet Couture Eye Tear Wipes. 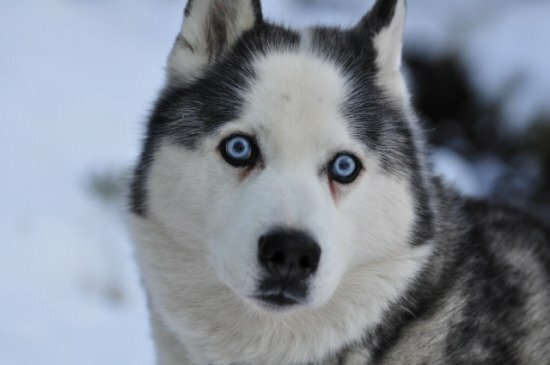 More information about eye tearing can be found in 10 Best Pet Shampoos For Healthy Skin & Fur. Before you give your pup any of the above supplements, be sure to check out the dosage instructions. With the right nutrients, your dog's eye health can improve for a healthier happier pet. I have not personally tried any of these supplements on my dogs, but I am a big believer in supplements, especially for older pets and believe that they can really help boost a dogs overall health. The ingredients listed in these supplements should be helpful in improving the health of your dog's eyes. Is your dog having difficulty seeing? You can test his sight with these ways to tell if your dog is losing his vision.